A few years ago, I went to a luncheon of the Chicago Culinary Historians at Big Bowl Asian restaurant. The inspiration for the restaurant, along with the very popular Wow Bao restaurants in Chicago, is Bruce Cost, who was the speaker for the luncheon that day. Bruce has been a major force in bringing the flavors of China, Japan and Southwest Asia to the American palate through his restaurants and cookbooks. And yet, when he was asked during his talk where one could find authentic Chinese food in Chicago, his answer was jolting: nowhere. Don’t expect it to be authentic. Make it yourself or go to Asia. OK, so he’s a purist, we all thought. The interlocutor rephrased the question: understanding that there is no truly authentic Chinese food here then, if you were just going out and wanted some decent Chinese, where would you go? Bruce didn’t waver: I wouldn’t, he said. When it comes to hummus, I have something like Bruce’s attitude toward what can be had in restaurants or purchased in the grocery store. It can be bland at best, and grainy at worst. With one caveat—Sabra hummus always struck me as very good and very creamy. That is, until I OD’d on it when I was working in Chicago by eating it at my desk every day for a lot—and I mean a LOT—of days, days that morphed into months, and I’ve never been able to eat it since. My worst hummus experience was, actually, at the apartment of a friend. This was many years ago, so many that I was still in school. This friend was someone with whom I wanted to be more than friends. He asked me to stop over one evening, and when I got there he was making hummus. From a box. Which must have had an expiration date from the prior decade. My desire to date the dude abated on the spot. Yet my respect for social propriety ruled the day. I ate a bite or two of the hummus made from an amalgam of unreconstituted dried chickpeas and tahini while he talked on and on about some girl he had the hots for, who happened to be Lebanese too. Good thing there was the bad hummus to keep me from feeling down. 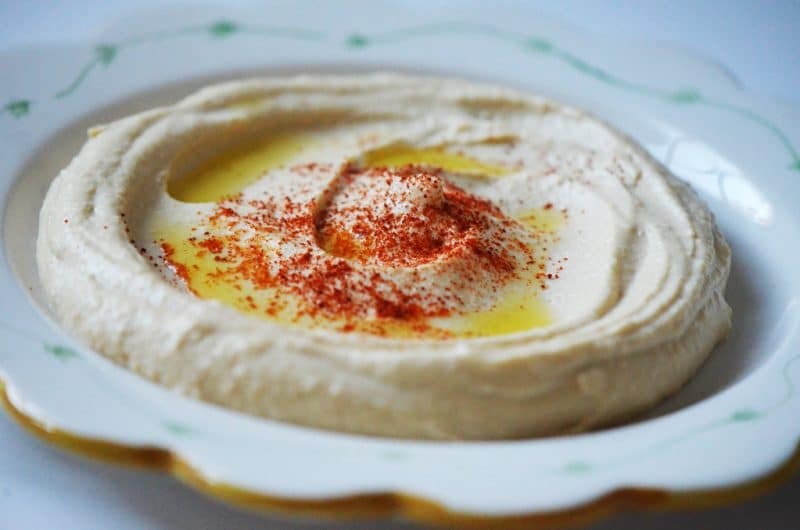 For me, hummus bi tahini must carry the distinct flavor of tahini, not be too lemony or garlicky, and most importantly, hummus must be smooth and creamy. There’s some debate about peeling the chickpeas to achieve that smoothness. Even at my most insane kitchen exactitude I have no interest in peeling a pound of cooked chickpeas, or pressing that same amount through a tami (a huge drum sieve) so I’m going to count on you feeling the same. Use a high-powered blender. If you don’t have one, consider it one of those purchases that is simply worth it. Ask Santa for it if you must, even if you’d prefer a new pair of shoes. I like Waring blenders, but got turned on to Vitamix blenders when I worked in a restaurant for a short time, so one of those may be on my hit list for the day when I have disposable income again. A good blender not only gives your hummus the right texture, it will do the same for your smoothies with ice cubes and a million other things. Don’t expect the blender to do all of the work. It’s a good friend, but not that good. You’ve got to stop it and stir numerous times throughout the blending process. Place the liquid ingredients in the blender first so that the mixture will blend and not get caught in the blades from being too dry. Blend for a longer duration than is comfortable. It takes a good 10 minutes of blending, stopping and stirring, tasting, adding more of this or that, and blending some more, to achieve good hummus. The addition of a little water assists in a creamy texture. The real secret to good hummus is not starting with canned or dried chickpeas and it’s not tahini. The secret to good hummus is…yogurt. Laban, or labne, to be precise—thin or thickened (I like using thickened, or labne). A healthy scoop, and then maybe a little more, will give your hummus the right body so that when you swirl it onto a plate, you’ve got a velvety whip of a hummus. It will taste that much better if you’ve made the labne yourself. This hummus is also delicious topped with toasted pine nuts. If you are a heat hound, add cayenne pepper to the mix for some kick. And while the yogurt lends a smoothing element to the hummus, make it vegan by leaving the yogurt out and add about 1/4 cup of water instead. 42 Responses to "Hummus bi Tahini, with a secret ingredient"
My mother told me that a lot of restaurants in Lebanon use fresh breadcrumbs from American style bread to thicken the hummus; I have tried this tip and it works, when the hummus I made is too runny, without altering the flavor. A lot of people add a pinch of citric acid. I prefer to add more lemon and more garlic! My aunt adds yogurt in her baba ghannouj and very little tahini. I guess it is a matter of taste. Breadcrumbs!! 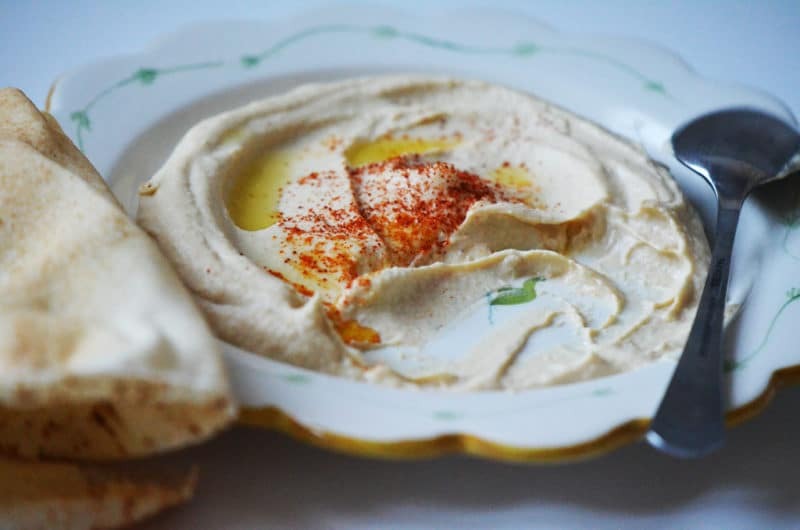 Fascinating and a great trick to fix runny hummus. Thanks Joumana! Love your permutation with the chile pepper…sounds delicious. Do you remove the “skins” of the chickpeas? I heard that makes it smoother. Also, I had a Lebanese chef tell me to use citric acid if you want to keep in the fridge for a couple of days. If you use lemon juice you have to eat it the same day. Thoughts on that? Removing skins, yes if you can get yourself committed to such a project…. 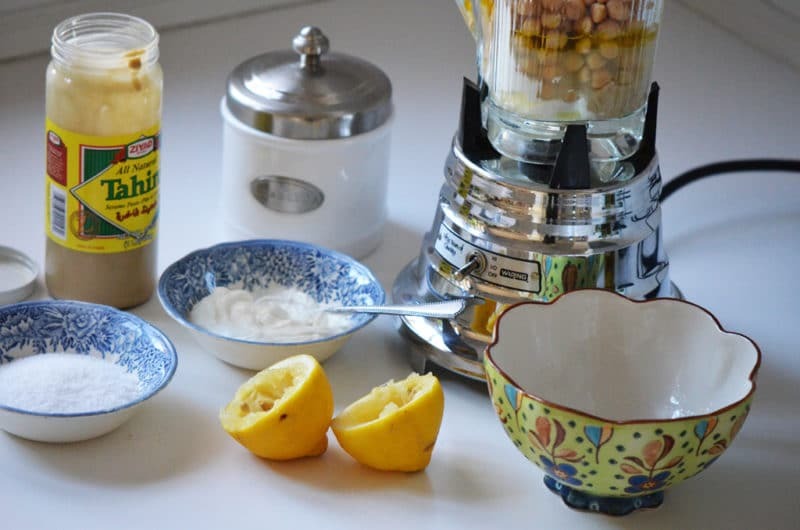 The lemon juice acts as citric acid and your hummus will keep for several days that way. Lovely hummus! And lovely blog too which I found through Healthy Aperture :-). Happy to know the secret ingredient in your hummus, and can’t wait to try out the recipe. I bought a Vitamix this summer-one of my best kitchen investments yet! Hi! Thanks for coming over from Healthy Aperture–great site and I’m happy to have my photos there. You have a Vitamix! I’m jealous…your hummus is going to be fabulous…. As children we were relegated to “skinning the chickpeas” and this was the WORST but thinking of the end result made it worth the effort. Today the chickpeas all go in the blender with their little jackets and nobody is the wiser. A trick from Alton Brown is to put a pinch of baking soda in the cooking water along with the chickpeas and salt, it does something to the ph of the water to make the skins really soft. Just put dried (not soaked) chickpeas in a crockpot with water/soda/salt and cook on high for about 3 1/2-4 hours. You end up with super soft chickpeas plus a pleasant tasting broth for soups if you like. Also, a food processor is a must for me. 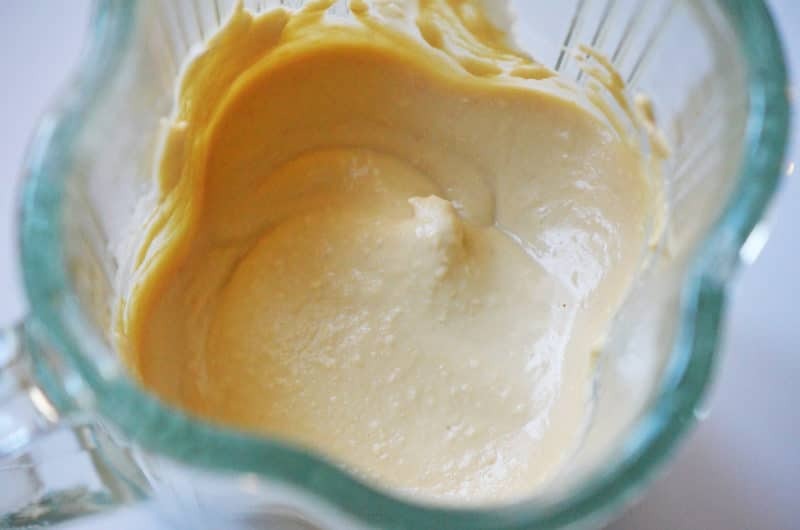 I tried making hummus in a (probably underpowered) blender several times and each time was a huge hassle with all the stopping, stirring, stopping, stirring, etc. Plus I like to make a lot to freeze so it was hassle x2 seperate batches! Then I got a Cuisinart FP-12 and haven’t looked back. Just put all the ingredients in, turn it on and blammo it’s done. No more hassle of stopping and stirring plus it’s big enough to make everything in one batch. Maureen: I can’t wait to try this huumus. My boys eat it so fast I vowed to learn how to make it and now I’ve come across your recipe! Thank you. I have not used labneh with hummus, but do you use it with Baba Ghannouj. I do not have a problem with getting the “right” consistency of hummus. I usually cook the beans really well (I start with soaking them with baking soda), and then use food processor with a bit of iced water. 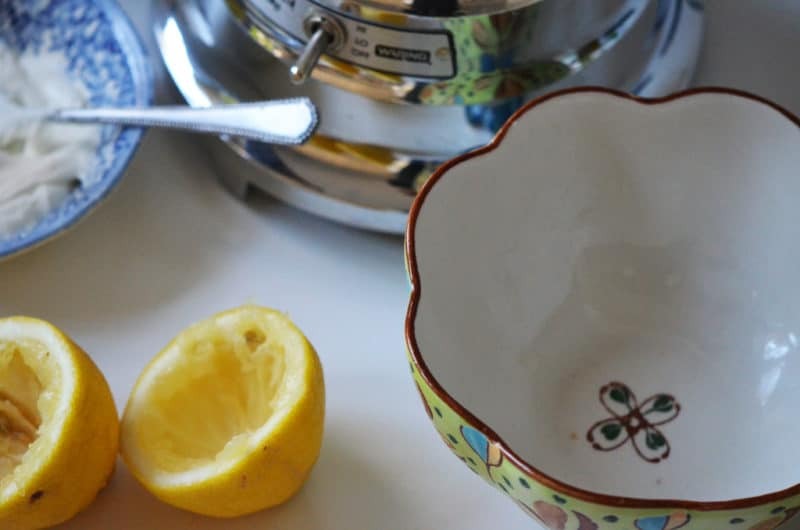 I adjust lemon/garlic to taste (usually I do not put garlic). But, I will try labneh on hummus next time. Thanks for the recipe. Great resource, I enjoy your blog a lot. Keep up the good work. Thanks. Elie, thank you for sharing that–I think the baking soda you use is helpful with the texture too! Let me know how you like it with the labneh when you make it next time! I usually use the canned chick peas, but boil them for about 10 min. and the skins that don’t float to the top slip of sooooo easily. Never used labne in Hummus, but will sure try it. I do use citric acid if I make a lot of hummus. Thanks….now all I need is Zatar Chips to go with the Hummus….yummm! this isnt vegan it contains yogurt.. Thank you–yes–just leave the yogurt out, increase the water and/or lemon juice, and the hummus will still be delicious. I’ve noted that above too. She said if you wanted it to be vagan to leave out the yogurt in the first part of her post. I enjoy your blog very much, especially about your dad. And your recipes are interesting as well. I think i should tell you a bit about me. You may want me off your blog. I am a British Jew and I live in Israel. The best hummus I have ever tasted was many many years ago in Jordan soon after the time when there was peace between us. It was soooo creamy and delicious. The picture of yours looks perfect. I like wiping it up with pita. Yum. Judy, it is such a pleasure to have you here, from way over there! Thank you for your wonderful and engaging comments…they mean a lot to me! As for that Jordanian hummus, I’d love to get my hands (and mouth) on it! Hi Maureen, You hummus recipe is fantastic! It was a hit on xmas day. Can you freeze it? Jenny, thank you! I have not frozen hummus before; I suspect it will go grainy, but worth a try (and I will next time I make it, too). It keeps in the fridge for several days. I love this hummus! Cannot find tahini anywhere in Laredo, TX, but it’s good without it. Before my hummus was always grainy, but I tried the hint of boiling the canned chickpeas with a little baking soda and got the smoothest creamiest hummus ever. I top it with a little homemade olive tapenade, and it’s my snack throughout the day with carrots and cucumber slices. I love the idea of olive tapenade on the hummus, Sandy, thank you! And sorry to hear you can’t find tahini there, such a staple now in most groceries. Also worth ordering online. Hi Maureen! I just discovered your website today (through the Saveur awards) and cannot wait to try this hummus recipe! My husband is Lebanese and I am Indian so I am severely lacking in Lebanese recipes. I always try to get recipes from his family, but they are so used to making them that they consistently leave out amounts so my attempts never turn out tasting as good. I cannot wait to try out many of these recipes because classic Lebanese recipes with step by step directions and great reviews is exactly what I was looking for! Nadia, that’s so great! Welcome, and I look forward to hearing about the Lebanese dishes you make! Hi again! I’m planning on making this tomorrow. I don’t plan on using labne so was wondering which yogurt you prefer to use to make this? Greek non-fat, Greek regular, plain non-fat, plain lo-fat, plain regular, etc? Also do you prefer this hummus recipe or the one you have listed with the lamb recipe? Thank you so much! Nevermind! Sorry just realized you answered this already. Thanks! Loved the article and comments about this dish, which has been a favorite of mine since the mid-1900’s. I’m curious though. When my parents spent some time in the Middle East, the Mediterranean wasn’t in China. Has it moved? Or has Bruce Cost forgotten his geography. Just for a few giggles. By the way, I haven’t ever heard of using chick peas in baba ghanoush. That’s a new one to me. Thank you so mich for this recipe–I can eat an entire Costco-sized container of Sabra hummus in a few days, and this hanit can get expensive, so I’d prefer to make my own. I would be using dried chick peas, would you recommend roasting the chick peas and if so, how? Roast them dry, then soak and cook, or soak and cook and then roast? Also at what temperature should chick peas be roasted? Would one cup of dried chick peas be equivalent to one 16-oz can? William–the chickpeas must be soaked overnight, then rinsed and boiled in fresh water until very tender–no roasting for this! A cup of dried chickpeas is about 2 cups cooked, and yes, that’s about 16 oz.! I haven’t tried the recipe here yet, but I added yogurt to my current recipe, it tasted much better! Hello I’m a Lebanese from Lebanon , I always soak the dry check peas all the night with some B.Soda, but by the way , the B.Soda (kills the vitamins) , but it help to soften of course . I rince them and cook well. Instead of yogurt I put liquid cream it give a nice taste in my food processor ( MAGIMIX), very power and good quality , second , instead of lemon juice ( cause lemon has water inside ) so you can’t keep more then 3 days In refrigerator . But if you put citric acid it last 1 week . Anyway thank you for all you are advices . Thankyou for all the wonderful comments for the homemade hummus!After eating homemade version by my friend, the commercial just doesn’t measure up and you can salt to taste+season as you prefer. Hi Maureen – Love your website – its a favourite. Ideally soaking the chickpeas overnight with a pinch or two of bi carb soda will help soften the chick peas and make them creamy. Ideally you need to buy your chickpeas with a very light colour and bigger is better the size. Dark small chick peas will give you a poor result. We travel 13km to get our chick peas, okra, butleh, nuts and spices. (Butleh is a watercress like weed which is essential for Fattoush or peasant salad. My children are now 5th generation born in Australia with Lebanese heritage from Kfarsghab and my wife and I have a family cookbook for each one of them before they leave home to carry on our great cuisine from our ancestors. We need to preserve these recipes as they are our memories of great grandmothers, grandmothers and mothers that need to carry on. We still make Kibbet Rahib or Good Friday Soup and regularly make Fasoolia with rice pilaf. Thanks for your recipes they are great. Many Years ago a Chef originally from Lebanon taught me his recipe for Hummus and he said it was very important to wait until the beans began to sprout, day 2-3 of soaking, because it meant the bean was then at optimum energy, health and flavour. It also determined if your seed was viable and not old and dead.